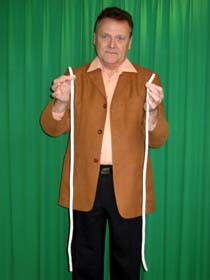 A piece of rope approximately 70 inches (180cm) in length is cut into two parts: short and long. 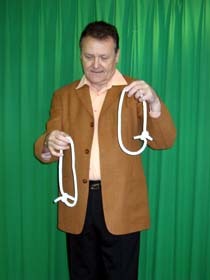 The two pieces are tied together. 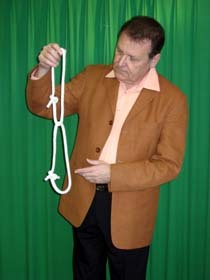 The rope is held vertically so that the knot is at the bottom. 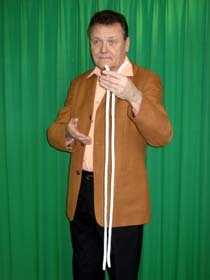 A gentle shake is given and suddenly the knot is seen to jump from the bottom to the center of the rope. 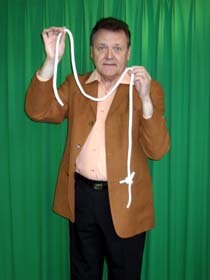 The knot is untied to show two pieces of the same length. 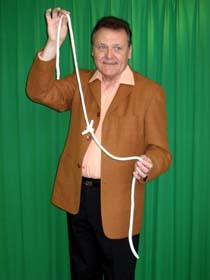 The ropes are retied. 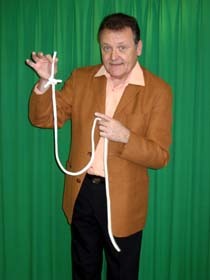 And a similar phenomenon occurs: the knot openly jumps from the center to the upper end of the rope and is untied. A short and a long pieces are exhibited like at the commencement. Both are shown separately ! 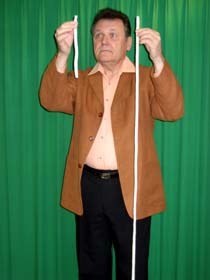 the rings fall down linked together. 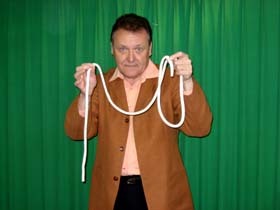 The knots are openly untied. as it was at the very beginning.